This robust and hearty fragrance brings to mind the manly scents of elderwood and cold pressed steel. Its rich aroma assails the olfactory glands with the force of a perfectly executed pile-driver. 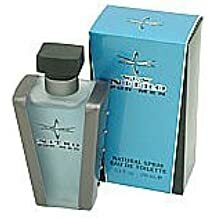 This eau de toilette was aimed toward the 18-30-year-old male, and came in a light turquoise packaging featuring the company’s logo.